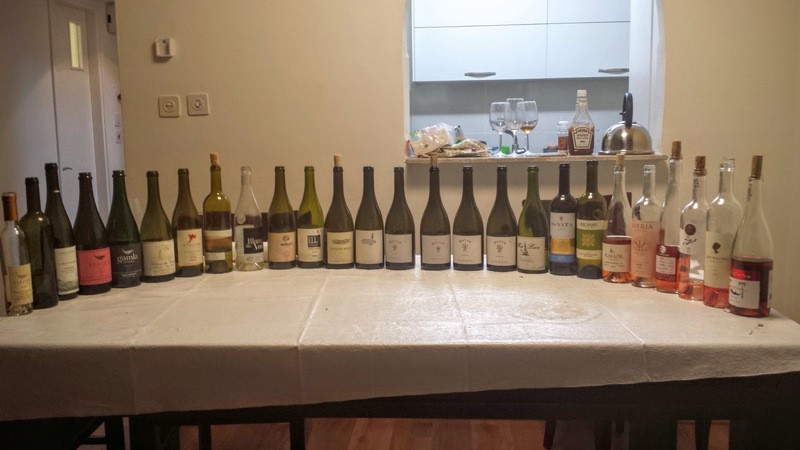 I have recently returned from another trip to Israel, and my main interest was tasting as many white and Rose 2013 and 2014 wines as I could possibly do do, in my short time in the Holy land. So, to meet that need I went to some 16 wineries and had two blind tasting of 26 wines each. The first tasting consisted of JUST white, rose, and bubbly and some sweet as well. The second was a bit more lenient and including some reds, which I will talk about on another posting. I want to take a moment to talk about the state of reds in Israel. I was hoping that with the release of some 2013 vintages things would be improving, sadly they have not! As you know, I have posted often about the issues that Israel faces in the kosher wine world. The red wines continue to be the same old stuff, unbalanced, fruit bombs with ripe fruit and no real unique characteristics at all. Even the super star wineries are slowing following the lead Yarden and making wines that cater to the single minded public – over the top, in your face, and lacking in balance and unique. Really, the true sad aspect of red wines in Israel today is more than just the lack of unique terroir, it is that they almost all taste the same. Cabernet wines are all the same, as are Merlot, and the famous Israeli blends. Even the great wineries are slowly moving towards the mean, with wines that are more fruit bombs then they are varietally true. The 2009 Yatir Petite Verdot was a shocker, I had it a few months ago and now it is showing true fruit bomb characteristics. Same can be said for some of the new 2012 Teperberg wines. Still, the 2011 wines from Teperberg are rocking as are many of the Yatir wines, though I picked on the PV. My point is that wineries are moving in the direction that meets the need for larger quantities. There are still star wines at Teperberg, including the lovely new Malbec and Chardonnay wines. Same for Yatir which continues to be in the top wineries of Israel, in my opinion. Still, when one sees the stars moving in that direction, I can only hope that it stops before it spreads. The saving grace of Israel wine overall, at this time, is the white, rose, and bubbly wines that they are producing! Think about what I just said, 6 years ago, Yarden was creating superstar wines, having just released, at that time, the 2008 wines and the reds were killing it. The whites were sad, and only a few rose were even in production. That all changed with a sudden shift in the production of far more rose and whites to the point where no matter how hard I tried, I could not taste all the whites and rose that Israel produced this year – good or bad. That would have been a very easy task in years past, but this year, even after making a concerted effort, I hope I covered the majority. I missed Psagot’s great new whites and Rose, produced under the caring hands/eyes of Yaacov Oryah, from acclaimed Midbar fame. To me, the stars of Israel are the whites and rose. They are everywhere. Every winery feels forced now to create wines for the hot Israeli climate, and it makes perfect sense. The wines for the most part are crisp and light and refreshing, some with more complexity than others. The varieties are growing, including some fascinating blends from the likes of Mia Luce and Tzuba Winery. Sure, there are lovely to superstar reds, from wineries like Matar, Netofa, Yatir, Flam, Castel, Tzora, Gvaot, Recanati, Dalton, Teperberg, Tura, Carmel Winery (Israeli labels), Ella Valley (for the Franc), and some others. So, if I was in Israel and I had a choice between red or white/rose – for a large majority of wineries, sadly I would only chose the rose or white. That is a sad state of affairs, but it is one that has been created by the Israeli wineries themselves. They always have the chance to change back, till then I will enjoy the wines made in California, Spain, France, and wait for bell curve to shift like it has in France and California. I hope Israel is only slightly behind them, but from what I had on this last trip, things are still going the wrong way in the world of kosher red Israeli wines. Finally, this list is a list of wines that I have personally tasted. There may well be many more wines that I have yet to taste, like the afore mentioned 2014 Psagot wines. That said, the notes and recommendations are the wines that I liked. There are other whites that are not listed here for a reason, and that is the rub. Is the wine not listed because I did not care for it, or because I did not taste it. For the most part I have tried my best to get to every white and rose in Israel on my last two trips. I know I have missed some, The Trio 14, the new Jezreel Rose, and others. Such is life. I need to make a few notes here about the wines listed here. Many will have very different opinions about the rose and whites that I like. The reason there is that really a rose should be treated like a white wine – NOT a red one. White wines will polarize people for sure, many folks told me they did not like the Yarden bubblies, while I adore them. Same for the Tabor Barbera Rose, while I really love that wine as well. What can I say, these wines, like reds, are up for discussion, and I have no problem with that. A quick note on Rose for a minute. Rose wines are normally made in one of two ways, either it is a by product of another wine (saignee) or it is crushed and pressed for the rose alone. There is a third way, blending white and red wine together, but that is rarely to never done in the kosher wine world. The original kosher rose in 2009 by Castel and earlier by others was done by the saignee manner, where the juice was pulled from a red grape wine, to concentrate the juice of the red wine. The outcome was that there was pink colored juice that tasted just fine, and it became the first Castel Rose. This was not repeated by Catsel going forward, because the wine is super high in alcohol for a rose. The grapes used in that wine were picked for a red wine, 14+% alcohol. So when the juice is bled off from the red wine, it is high in alcohol – like the red wine is. So, if you see a high alcohol rose, you know which method was used, and for the most part will not always create a crisp, tart, and refreshing rose. The other and most prevalent manner used here in the rose wines listed below, is the manner by which white wines are created, excepting for the post crush soaking that does not happen with whites. So, normally white wines are picked, crushed, and then immediately pressed, so that the juice does not sit in the white/green grape skins, which could be used to create an Orange Wine. However, rose wines want to color from the red grapes, so they are picked early to keep the tart flavors, then crushed, and allowed to soak in the red grape must (with the skins) for whatever time the winemaker feels will give them the color and flavors they want. Once that is achieved, the wine pressed and it goes into tanks (excepting for Agur and some others) where it lives to ferment and then is filtered and bottled. Some ferment the juice in barrels, as stated, like Agur, some ferment the grape juices separately, and then create the blends later, after fermentation. Finally, some do not let the grapes go all the way, and leave the wine off-dry. One of the famous off-dry rose, Dalton is still too sweet for me, but it is here for completeness. Also, the wines listed here are mostly 2014 or 2013, I did that on purpose. Except for the Chardonnay wines, bubbly, and maybe the Semillon wines, age is not a quality on the other white wines. The older they get, the more they lose the crisp and bright notes that make them unique. Sure, the Mia Luce is an exception, but for the vast majority of whites and rose, PLEASE keep them to a year of age and that is it. You will appreciate them more, they are more crisp with more of a bite than the 2013 and for sure on the 2012 wines. Viognier – really only exists in Israel, stick with the 2014 Dalton Viognier and the 2014 Psagot. 2013 Dalton is turning – DRINK UP!! Roussanne – 2013 Tabor, Gush, 2012 Shirah in their Vintage Whites blend, and in the 2014 Recanati RSR White, which I have never been a fan of. The Binyamina has died. Pinot Grigio/Gris – In the past this was a graveyard, now 2014 Lueria, 2013/2014 Dalton – BRAVO! So, without further ado, I will list many of the white and bubbly wines that I have found to be very good to excellent, or in my parlance, B++ to A- and up. Finally, this is my list of white favorites, I would really love to hear your favorite white wines, so please post comments below. In many ways even better than the 2008, and now this epic wine will be sold in the USA! This vintage shows more red fruit than 2008, but the insane acid is there, with mousse of small bubbles and citrus madness. The wine is a blend of 70% Chardonnay and 30% Pinot Noir, giving it a pinkish hue. The nose on this lovely rose colored bubbly is ripe with raspberry, plum, yeast, and spice. The mouth on this medium to full bodied wine is rich with lovely structure, along with layers of sweet and tart fruit, pomegranate, candied cherry, grapefruit, lemon, and strawberry, all wrapped in a small focused mousse attack and ripping acid. The finish is long with a clean attack of acid, tart fruit, lemon friache, floral notes, and yeast. BRAVO!!! The 2008 vintage is more tart and citrus than the epic 2007 vintage and in many ways, but the 2007 is more regal, rich, richer and more hedonistic than the 2008. The nose on this lovely wine is filled with rich mineral, slate, rock, and yeast. The mouth on this medium plus bodied wine is rich and layered and elegant with a lovely mousse of small bubbles, lemon, grapefruit, mad citrus, followed by tangerine, lime, intense mineral, baked apple pie, and brioche notes. The finish is long, tart, acidic, with non stop tart fruit, herb, and lemon zest – BRAVO!!! The notes on this wine are consistent with my last tasting. Please make sure to be getting the new bottling, which is the mevushal bottling – which is newer. The nose on this bubbly and effervescent light pink colored wine, is hopping with strawberry, lemon, light char and smokey notes, and cherry. The mouth on this light to medium bodied wine is packed with small bubbles that are active and alive; that are clean and well made that mingle well with green apple, Asian pear, brioche and bracing acidity. The finish is long and tart with core acidity, strawberry, bubbles, and a lemon burst at the very tail end. BRAVO! To call this brut wine a rose, is such a misnomer that it is not even close. This should have been called a Rose Brut, like the 2007 Blancs de Blancs is called a Blanc! Still, what can you do the labels are printed and such is life. The wine is made of 30% Pinot Noir and 70% Chardonnay, and then was bottle aged for 5 years on its lees. It is a classic bubbly wine that I have now had the chance to spend a Shabbos with and taste three times. I asked a few winemakers about it, and each replied with their own leanings, some find it a perfect match to Champagne and some find it too light for them, liking more the Blancs de Blancs brute force and style. To me both wines are a wonderful gift to the kosher wine world and a must for anyone drinking sparkling wine. As of now the wine is not going to be imported to the US – so buy it when you are in Israel.The nose on this beautiful pink salmon colored wine is rich and redolent, but shy as well, with classic yeast notes, followed by pink grapefruit, strawberry, and peach. The mouth on this medium to medium plus bodied wine starts off with a lovely attack of fine bubble mousse, freshly baked and then toasted brioche, along with green apple pie, freshly roasted almonds, pear, and cherry notes. The finish is long, luscious, and captivating with bracing acidity, candied currant, fig, and white chocolate. BRAVO!!! The Yarden Blanc de Blancs is made entirely from Chardonnay grapes grown in the northern Golan Heights, Israel’s coolest viticultural area. The wine is made strictly according to the traditional method (méthode champenoise) including hand harvesting, pressing of whole clusters to increase acidity and fruit flavors, and secondary fermentation in the bottle. Disgorging took place after five years of bottle aging on the tirage yeast.Are u kidding me! A filthy wine with a nose of intense fruit, lemon curd, peach and apple cobbler, brioche, and nice toast that gives way to ripe green and yellow apple, and crazy insane ripe lemon curd. The medium mouth is wow in a single word. Thanks to Gabriel Gellerfor selling me the bottle, and sharing it all around. The mouth is insanely ripe and intense and ripe with ripe baked anjou pear, freakish assault vehicle of acidity and small mousse bubbles, with lovely yeast and brace for it – mouth coating tannin!! The finish is long and tart with insane grapefruit, bitter and rich grapefruit pith, and lemon zest. Bravo!!! This nose is lovely with yeast, and spice, nice peach, green Apple brioche and spice. Lovely medium body with great acid, great brioche, small bubble mousse, pear and citrus with apple pie and spice lingering. The finish is long and tart, with good acid, lemon friache and fig. To me this is the best vintage that Shivi has made of this funky blend. The nose shows tropical fruit, with guava, melon, and kiwi. The mouth on this medium bodied is far more in tune with itself, than in previous vintages, in my opinion, with cherry, raspberry, along with green apple, brioche, and nice spice. The finish is long and mineral, with great balancing acid, slate, mineral, and nice herb. NICE! This is a nice Chard with good fruit structure and spice. The nose on this wine shows nicely with peach, apricot, brioche, and herb. The mouth on this medium bodied wine is nice with toasty notes, lovely green applle, nice vanilla, spice, hints of earth, saline, and good balancing acid. The finish was long with mushroom, fig, and nice herb. Nice! Please do not get me wrong, but to me this was the weakest of the wines, which is saying a lot with an A- score. This wine is a lovely expression of a Cali Chardonnay, with enough acid to keep my attention, but it does not have the crazy acid or mineral that the other white wines were showing. Still, it is a lovely Chard, and it was aged in 100% new oak for 9 months.The nose on this Chardonnay is rich and toasty with clear oak notes, lovely apple cobbler, spiced yellow apple, and crushed herb. The mouth on this full bodied wine is viscous and plush, with an attack of spiced summer fruits, butterscotch, rich peach, apricot, showing ripe fruit in this round and textured mouth, with a spicy bite, brioche, yeast, and sweet oak. The finish is long and buttery, with sweet quince, pear, nutmeg and sage. Very Nice. This is a special wine made for the Derech Hayain wine stores. It is mostly Chardonnay with a bit of Sauvignon Blanc added in. It is crazy because this was tasted blind like all the other wines in this tasting and we thought it was an SB – no way this was a chard! The bit of SB overpowered this wine in a very special manner. This wine has a lovely nose of wet grass, cat’s piss, gooseberry, with citrus and lemon. The mouth on this medium bodied wine is crazy with sick ripping acid, intense crazy citrus pith, nectarines, with rich sweet and tart fruit, it flows into lemon grass, pineapple and tart yellow grapefruit. The finish is long with straw and mineral finish with crazy kiwi lingering. BRAVO!!! The nose on this light gold wine is redolent with bright notes, peach, fresh baked apple jam, and cobbler, along with baking spices and toast. The mouth on this full bodied wine is a beast – to be nice, it is a burly beast that truly needs a few years to calm down. The mouth is rich and layered with searing acid and oak, followed by quince and green plum pie that keeps coming at you in layers of fruit, acid, and toast while keeping well balanced and concentrated. The finish is long and super spicy with nutmeg, allspice, cinnamon, and cloves, with white chocolate, herbs, summer fruits, and spicy oak on the long finish. BRAVO! Maybe one of his best, but only time will tell. This wine will be best from 2015 to 2021. This wine has been getting less oaky from release, but it is still too much of an oak bomb for my at release. Normally, a Katzrin white is far more enjoyable three or so years after release – then at release itself. The nose on this wine shows creamy notes, butter, insane oak, along with a peach perfume, and a apple cobbler. The mouth on this medium to full bodied wine is nice with good toast, intense spice, along with guava, citrus, and layers of spice, fruit, and brioche. The finish is long with sweet lemon tea, nutmeg and almond. This wine is a blend of 90% Chardonnay and 10% Sauvignon Blanc. The nose on this lovely wine starts with a perfume of sweet oak, spice, along with lovely baked apple pie, and citrus. The mouth on this medium bodied wine feels fuller from the lovely viscosity of the wine that coats the mouth, showing apple, grapefruit, quince, balanced with lovely acid, tart apple, nectarine, and lemon friache. The finish is long with nice acid, brioche, baked goods, and pith. Nice! The nose on this lovely wine starts off with rich butterscotch, buttery nose, ripe pineapple, creme fresche, and apple. The mouth on this medium to full bodied wine is rich, viscous, and creamy, with great balancing acid, showing nice elegance and balance, lovely brioche, sweet oak, with guava, melon, layers of grapefruit, yeast notes, and Asian pear. The finish is long with sweet fruit, showing nice nutmeg and sweet spices, with good mineral, saline and slate lingering. Bravo! What can I say, for reasons I do not understand myself, Hagafen Chard never did it for me. This one is very nice to very solid. The nose on this light gold colored wine is lovely with quinine, quince, sweet oak and peach pie. The mouth on this medium body is refined with great control, nice sweet cedar, lovely brioche, baked quince pie, guava, pear, with spice and mounds of fresh baked goods. The finish is long and fresh, with nice balancing acid, along with great cloves spices more baked goods, lovely nutmeg spice and herb. Very Nice! This may be called a Chardonnay, but if you tasted it blind, you would never have guessed it. The nose on this wine is crazy, and non-typical with intense apple, banana, rock, with nice green notes. Nice round mouth with ripping acid and sweet notes of guava and melon, but balanced with green tea, peach, and tart quince, with mad grass, straw, and tart rock fruit. Long and mineral finish with slate, roasted herb, green notes, apple, kiwi, lemon madness, with yellow grapefruit lingering long. This is the best Tavel I have tasted by far and one that is worthy of your time to find it. The wine has organic on it, from a European perspective, but it will not be on the USDA label because that would require ZERO added sulfites, which is suicide for a wine. With that said, the vines are organically grown and the wine has a very minimal addition of sulfites, of 150 mg (or 150 ppm), and may even be less than that.The nose on this cherry colored wine is beautiful with cherry notes, green foliage, slate, and rock. The mouth on this medium bodied wine starts with lovely acid, followed by earth, dirt, quince, currant, herb, lovely pith and spice. The finish is long and bitter with orange pith, spiced strawberry, summer fruit compote, and lovely herbs with eucalyptus lingering long – BRAVO!!! The wine is a blend of Barbera and Merlot grapes. The nose starts off with nice flint, pink grapefruit, along with nice raspberry,strawberry and orange hints. The mouth on this medium bodied wine continues to be one of the best QPR Rose wines out there, a refreshing wine with lovely spice, nice balancing but not ripping acid, with lovely green apples, herb, citrus, and spice.The finish is long, tart, and refreshing with great pith, quince, and Dragon fruit. This wine may be at the same epic status as the famed 12 Shirah rose and the 13 Hajdu rose. The nose is pure heaven, with mad spice, mineral, sour kirsch cherry, earth, and quince. The wine is layered and complex with candied but controlled fruit, wrapped in mind blowing acidity and mineral that it cuts through anything I was tasting. The pith is searing with the perfectly focused acid, topped by pink candied grapefruit, lemon, gooseberry, candied raspberry, dirt, and more pith. The finish is so tart it is crazy, with mineral and earth closing it out! BRAVO!!!! This is a must buy, go out and get a bunch! The 2013 vintage was too sweet for me, but this vintage was perfect, well balanced and showing lovely acid. The nose on this wine made from 100% Pinot Noir, was redolent with strawberry, herb, raspberry, slate, and mineral. The mouth on this lovely medium bodied wine has some weight and viscosity, but well balanced with tart fruit, ripping acid, crisp and refreshing, showing currant, pink grapefruit, quince, lovely saline, gooseberry, nectarine, and more tart fruit. The finish is long and tart with nice pith and more acid rounding out the finish. BRAVO!! This wine is blend of 50% Syrah and 50% Mourvedre. The nose on this beautiful cherry colored wine, is also Pierre’s best by far, and right up there with the other 2014 rose blockbusters; the 2014 Tabor Barbera Rose, the 2014 Recanati Gris de Marselan, and the 2014 Gvaot Rose. The nose on this wine is INSANE and starts with smoke, flint, mad floral notes, rose hips, crazy mineral, showing like a feminine floral rose, but backed by intense mineral and smoke. The mouth on this medium bodied wine is packed and crazy and very busy (in a great way), with mad quince, juicy raspberry, dry cherry, ripe plum, all balanced by ripping mineral, graphite, slate, mad acid, along with mounds of orange pith, topped by hints of nectarine, and dry rose hips. This mouth is one of the more complex rose I have had since the famous 2013 Hajdu Roseand the 2012 Shirah Rose. The finish is long and dry with lovely saline, mineral, candied grapefruit, finishing with more pith, and slate – BRAVO!!!! The wine is a blend of Petite Verdot, Merlot, Cabernet Franc, and Malbec. The nose on this gris colored wine, is rich with floral notes, jasmine, and rose hips, followed by a perfume of mineral notes, sea aromas, and peach. The mouth on this medium bodied wine is ripping with great acid, saline, ripe cherry, strawberry, followed by an attack of ripe and tart pink grapefruit, intense citrus, and green herbs. The finish is long and floral, and mineral, with more saline, rock, slate, and cloves, nectarine, and long lingering pith. Very Nice! This wine is a blend of Cabernet Sauvignon, Cabernet Franc, and Syrah. The nose on this lovely pink color shows ripe and dried fruit, with crazy steely strawberry, raspberry, dried grass, and tart fruit. The mouth on this medium bodied wine is crisp with mad acid , lovely cranberry, lovely tart grapefruit, kiwi, gooseberry, with lime, lemongrass, intense spice, and lemon peel all wrapped in a viscous and lovely mouth feel. Lovely long tart/fresh finish with mineral galore, saline, slate, tart fruit compote, and green olives lingering long with pith and sweet tart fruit, BRAVO!!! This is the second rose from the famous Wiess Brothers, AKA Shirah Winery. The last one was one of the best rose I ever had (along with Hajdu 13 Rose), so sure this wine has a huge legacy to uphold, sadly it falls short, but it is still a lovely wine in its own right.The nose on this wine is ripe and rich with bubblegum to start, along with life savers candy, mad citrus, grapefruit, and flint/rock. The mouth on this medium bodied wine is rich and acidic and lovely, with layers of dark and blue fruit, that are caressed by a rich core of zinberry notes, boysenberry, kiwi, followed by lovely tart pomegranate and bitter plum. The finish is long with nice spices, more tart fruit, crazy citrus pith, with zinberry/raspberry/blueberry lingering on the long tart and pith finish. Very Nice. OK, this wine is another polarizing wine, some will love it, others will think it is dead and undrinkable. Trust me, we tasted it blind and many thought that. The nose on this gris colored wine is indeed old world, dried fruit, earth, dirt, mineral, saline, and no sweet notes to be found. The nose on this lovely wine is filled with dried apple, mad quince bomb, along with wicked earth, and dirt. The mouth on this medium bodied wine is how they like it in Provence, focused, mineral, straw, dried grass, slate, dirt, earth, crazy acid, and barely any fruit to be found with pear and green apple making an appearance with time. The finish is focused, saline, mad acid and mineral bomb. Bravo! This wine is a rose of 68% Grenache and 32% Tempranillo, and it is not officially the first ever from Yatir, but the first one in many many years. The nose on this beautiful cherry colored wine starts off with rich tart acidic fruit, strawberry, with lovely peach, lemon, and lime, along with lovely lemongrass, minerality, spice, and herb. The mouth on this lovely wine is much like the one from Castel with floral and fruit focus, but not with the same ripping acid as the Bat Shlomo or the Tabor rose. The wine is medium bodied with lovely acid, well balanced with nice pith, rose hip, sweet and tart fruit, sweet grapefruit, nice herb, sweet apple and pineapple. The finish is long with good lingering orange pith, mad saline, rock, and elegance. This is one of the best rose that I have tasted this year, with a few others listed here. The nose on this lovely pink colored wine is filled with crisp fruit, great strawberry and cherry. The mouth on this medium plus body fills your mouth with a rush of ripping acid, followed by ripe summer fruits, wild raspberry, crazy quince, nectarines, mad ripping grapefruit, intense lemon, and crazy acid that dominates, followed by a rush of saline and intense crispness that makes u have to smile. The finish is long and spicy, with clean slate finish, nice nutmeg and straw. BRAVO!!!! This lovely rose is made from 100% Syrah. The name Beret completes the bracha line, “Beret Prix Hagafen”. The nose on this beautiful salmon colored wine is redolent with with great cherry, raspberry, strawberry, along with lovely floral notes and sweet fruit. The mouth on this lovely medium body starts with great spice, currant, grapefruit, citrus, and cloves. The finish is very long and spicy with great mineral, saline, intense acid, tart fruit, crazy grapefruit and lemon linger long on a spicy and saline finish. BRAVO!! The wine is a blend of 78% Merlot and 22% Cabernet Franc. The nose on this wine is unique with aromas of dry grass, intense tart fruit, with kiwi, lemon, and strawberry. The mouth on this wine is very nice with good acid, cranberry notes, along with gooseberry, mad straw, tropical fruit, nice floral notes, along with dried fruit struicture, dried apple and dried pear. The finish is long and dry with nice balancing acid, good pith that lingers with straw, mineral and stone. Nice! This wine is a blend of 50% Mourvedre, 40% Cabernet Franc, and 10% Cabernet Sauvignon. The wine is crushed, left to stay in contact with the grapes for a couple of hours, then pressed and fermented in oak barrels. The nose on this light rose colored wine is lovely with ripe strawberry, straw, lovely cherry, candied apple, raspberry, with lovely saline and dry fruit. The mouth on this medium bodied wine is floral with nice rose hips, peach, balanced well with good acid, very nice saline, showing a viscous mouth (not as lovely as the 12 or 13), with nice summer fruit, peach, and kiwi. The finish is long with lovely slate and lingering pith on the long finish. The nose on this lovely wine is redolent with crazy pink grapefruit, candied strawberry, raspberry, mad quince, peach, candied fruit, and herb. The mouth on this medium bodied wine is smokey, with saline, tart fruit, good balancing acid, a crazy mineral based rose, but the fruit is hiding upon initial opening, but with time the fruit comes out; candied plum, kiwi, pear, crazy herb, menthol and mineral. The finish is long with saline and spice, slate, with cloves, pith, and nectarines ripping through the nice weight. Bravo! This wine is a blend of 70% Syrah and 30% Grenache, a rose very much of the Tavel makeup. The nose on this peach colored wine starts off with sweet peach, along with nice tart raspberry, gooseberry, earth, and perfume of floral notes. The mouth on this medium bodied wine is crisp, tart, and full of nice acid, with good structure and spice, showing lovely strawberry and sweet orange marmalade, with nectarines, and dried apple peels, all wrapped in searing acid and sweet fruit notes. The finish is long and balanced with nice pith and sweet notes lingering. As I stated above, this is not one of my favorites, but for the price it is not so bad. The QPR winners in this section are Recanati, Goose Bay, Hagafen, and Netofa. The wine is a blend of Shiraz, Cabernet Sauvignon, and Barbera. The nose on this nice wine shows rich mineral, guava, with cranberry, strawberry, lovely kiwi, and lots of mineral. The mouth on this medium bodied wine is off-dry with residual sweetness that throws me off, but gives the wine a mouth coating weight but lacking the acid I crave, with grapefruit, cherry, and pineapple madness. The finish is long and sweet with enough acidity and pith to bring it together. This is one of those unique and very nice blends with 30% Gewurtztraminer, 30% Riesling, and 40% Chardonnay. The nose on this wine starts off with tropical notes, guava, kiwi, honey, honeysuckle, floral notes, and peach. The mouth on this medium bodied wine has a nice almost oily viscosity that adds richness to the mouth, but the acidity is crisp, with honeyed fruit, melon, and apple. The finish is long with nice spice, good fruit structure, slate, mineral, and nice herb. The wine is blend of 95% Colombard and 5% Chardonnay – WOW!!!! Please make this available to everyone. To me, I prefer this wine over the white RSR. I have never been a huge fan of the white RSR, to me it lacks the acid and while it is a more polished and professional wine, this wine makes me happy. The wine is so tart and ripe and pithy that it puts a smile on my face when I tasted it. The nose on this lovely wine starts off with ripe guava, quince, melon, and hints of brioche, and vanilla. The mouth on this medium plus bodied wine is round, ripe, rich, and perfectly balanced and tart, with great acid, grapefruit, sweet honeysuckle, floral notes, along with lovely pith. The finish is long and tart/bitter with mad citrus and dried nectarine lingering on the intense mineral and rock finish. BRAVO!!!!! This wine is an unasked classic Bordeaux blend of 50% Semillon and 50% Sauvignon Blanc. The nose on this lovely wine is filled with tart green apple, lovely fresh cut grass, with straw and kiwi in the background. The mouth on this lovely medium bodied wine is well structured with sick ripping acid, rich and deep mineral, with green apple, melon, intense spice, Asian pear, green notes, and herb bringing the mouth together. The finish is crazy long and herbal with intense slate, rich cloves, peach, cat pee, lemon friache, citrus pith, intense and insane saline, and lovely mineral madness. Once the fruit comes and goes off your palate all you remember and feel is crazy saline, slate, mineral, straw, and rock. The mineral and saline madness is something I have truly not had often – MEGA BRAVO!!! The wine is a blend of 49% Viognier, 33% Roussanne, and 33% Chardonnay. The nose starts off with a lovely garden of violets and jasmine, surrounded by a lush garden of honeysuckle, ripe peach, apple, and ripe melon, all enveloped with an impressive and intoxicating perfume. The mouth on this medium bodied mouth shows the 8 months that this wine sat in French oak, with a light oily texture, spice, lovely saline, brioche, baked apple pie, layered with fruit and fresh compote. The finish is long and spicy with cloves, toast, hints of petrol, straw, and more saline – BRAVO! This wine is a blend of many the white varietals that Gush has; Gewurtztraminer, Chardonnay, Sauvignon Blanc, Viognier, and Roussanne. The nose on this lovely wine is tart and off dry with ripe summer fruit, peach, apricot, melon, grapefruit, and spiced Asian pear. The mouth on this medium bodied wine is expanded with the residual sugar, showing light petrol, dried fig, rich herb, dried honeysuckle, gooseberry, and green apple. The finish is long but I could have used more bracing acid, nice fruit, and spice. This was a very unique and interesting wine, it is a blend of 80% Roussanne and 20% Viognier. The wine is made by Itai Lahat, the new super wine consultant of Israel. The nose on this wine is fascinating with mad smoked fruit, heavy toast, peach, honeysuckle, straw, and apricot. The mouth on this medium bodied wine is crazy with rich oily texture, showing heavy oak, lovely spice, smoked peach, grapefruit, hints of tannin, and lovely bracing acid that envelops the brioche, and spiced apple pie. The finish is long, spicy, balanced, with intense acid, tart fruit, herb, saline, and lovely slate – VERY NICE! This wine is a blend of 60% Sauvignon Blanc and 40% Chardonnay fermented and aged in steel. Personally, I think this is the best kosher blanc so far. The nose on this lovely wine is ripping with ripe grapefruit, steely freshness and saline, along with fresh cut grass, gooseberry, crazy citrus, lemon friache, and lovely tart fruit. The mouth on this medium bodied wine is ripping with core acidity, tart nectarine, spice, and mineral. The crisp and fresh wine really is impressive. The finish is long with nice tart fruit, lovely floral notes, orange, and lemon pith. Bravo! This wine is a 50/50 blend of Semillon and Sauvignon Blanc, which was aged in oak for 8 months. The nose on this lovely wine is all about balance with a lovely steely nose, with rich vanilla, ripe kiwi, grass, and straw. The mouth on this viscous full bodied wine is lovely, with ripping acid, green apple, lemon friache, lovely tart fruit, quince, and grapefruit. The finish is long, rich, and layered with brioche, peach, more acid, slate, and mineral. Very Nice! OK, I must say this is a wine that will create divergent opinions. It has funk and wet notes that many think are socks but are really just dried notes of the semillon. The wine is a blend of 93% French Colombard and 7% Chardonnay. The nose is sour with funky sock smell, lovely flint, mineral, and earth. This nose is truly old world with earth, dirt, mineral, and funk. The mouth on this medium bodied wine is unique to say the least with crazy quince, pink grapefruit, apple peel, all wrapped in a rich, viscous, textured mouth feel, that is combined with crazy acid, dried nectarines and orange pith. Many will have issues with this one, so serve carefully but enjoy!!! This wine is a blend of 86% Chardonnay and 14% Suavignon Blanc. The nose on this lovely wine shows rich toasty buttery oak with sweet Apple pie, mineral and roasted herb. The mouth on this wine shows its Chard leanings more now, with the SB taking a back seat, with a lovely round mouth, layers of Apple pie, brioche, and lovely ripping acid, pineapple, melon, mad mineral, pear pie, and tart green apple. The finish is long with layers of spice and tart Asian pear, lemon friache, with nutmeg and spice. Elvi continues to make wines that impress with a wine that shows a lovely nose of classic sb notes with grass and quince. Nice mouth with nice ripping pith, pineapple, guava, along with pink grapefruit, all showing well in the round mouth with honeyed notes, lemongrass and straw. The finish is long and sweet with honey and citrus pith. This wine is unoaked and the entry level – the way I like it, and is a blend of Sauvignon Blanc, Viognier and Sémillon. Tasting this side by side many other SB, you can tell how dry and wet grass this lovely wine is. The nose on this lovely wine starts to open with time to show honeyed notes, along with ripe fruit, crazy lemongrass, lemon friache and lime. The mouth on this nice, not complex wine is rich with nice acid, crazy rich peach, with apricot, pear, lime juice taking control with hints of quince and mineral and lovely structure. Long and spicy finish with mineral and pith. This wine is a blend of 86% Chardonnay and 14% Sauvignon Blanc. The nose is lovely with smokey notes, with peach, mad green Apple peel, with non sweet notes, creamy and buttery notes, lovely lemon and lemon grass. The nose is lovely, but the mouth is what makes the wine insane, what a mouth! The wine shows crazy acid, rich lemon, lovely apricot, green apple with insane saline, green olives, lovely quinine, with roasted herb. The finish is long and mineral, and richly salty with lovely lime, chalk, flint, and earth. Bravo!!! I have now tasted this wine three times, and it is here on the list because of its uniqueness and not its great value or quality, IMO. Yes, it is a nice enough wine, but there are many nice enough white wines in Israel. This wine sometimes shows very nicely with a unique mouth feel, and other times it shows off notes, dirty socks and the such. This has happened enough times that I must call it out. The wine is a blend of 63% Pinot Noir and 37% Grenache. When it is on the wine is far more viscous and biting with its acidity, when it is off, it is just there and lacking the bite or the mouth feel. The nose on this light pink colored wine shows peach and flowers with violet, and smoke, flint, earth and garrigue and roasted herb. The mouth is medium in weight with nice acid, slight residual sugar, round and almost viscous, with good pith and good herb, tart fruit, and good acid, that is followed by grapefruit, gooseberry, quince, lemon, good viscous mouth, asian pear, and dried quince. The finish is long and spicy, with better acid showing over time, nice white pepper, lovely pith, and cloves. The wine is keeping with the old names of the Midbar winery, but not its blend, with this wine being a blend of 55% Viognier and 45% Chenin Blanc. The labels and official kosher supervision may be new, but the ripping acid and unique flavors of the south are very much the same! The nose on this lovely wine, shows mad spice, with a ripe fruit perfume, with lovely honey and quince from the Viognier and sweet yellow apple and candied pear from the Chenin Blanc. The mouth on this medium bodied wine is lovely to start with ripping core acid, balanced perfectly with sweet southern Israel fruit, the peach and the apricot are classic Viognier flavors, along with the dried apple and lovely garrique and straw from the Chenin Blanc that calms down the sweet fruits. The finish is long and lovely with sweet/tart notes, nice acidity, floral notes and violets that cover the honey and orange nectar. Mineral and saline and acid lingers long. BRAVO!!! The wine is a blend of 65% Chardonnay, 20% Viognier, and 15% Chenin Blanc. The nose on this lovely wine is dry with notes of ripe peach, floral, with honeysuckle, violet honey, with mad perfume, one of the real highlights of this wine. The mouth is well rounded and medium in weight, with perfect balance and acidity, with hints of oak rounding the mouth, searing puckering acid that lifts the peach, candied apple pie, nectarine, tart lemon curd, and quince – wow. The finish is long and acidic to its core, with floral notes and sweet herb demanding attention on the long and mineral finish. Bravo! This is the Weiss Brother’s third vintage of Vintage Whites and it may well be their best, fighting for best place between the 12 and this 14 vintage. This wine is a three way Rhone white varietal blend with 70% Viognier, 12.5% Marsanne, and 12.5% Roussanne. This blend again, is very reminiscent of the Recanati White RSR, though that one is aged in oak and it shows, while this one is fresh, bright, and lovely!Anyway – this is clearly a viognier wine, being 75% of the product, but the Roussanne is felt with the earth, clay, and garrigue. The nose on this lovely wine is richly perfumed with rich honeyed notes, along with ripe melon, pineapple, honeysuckle, fresh tart peach, flint, and ripe white plums. The mouth on this full bodied and oily textured wine is pure heaven, with a lovely good and expressive conflagration of sweet summer fruit from the Viognier fruit, including ripe apricot, violet, and Asian pear, with equally clear expressions of Roussanne showing in the orange pith, straw, slate, and mineral notes. The finish is long, tart, sweet, and bitter – all at the same time, with acid, nectarine, orange pith and almond notes lingering long in the background. BRAVO guys BRAVO!!! I want to note that there lacks the the ripping acid that I crave, but acid is clearly present and appreciated, but yes I could do with more. Still, the the pith and mineral make up for it!!! The 2014 picks right up from where the 2013 left off, bracing acid and tart fruit. The nose on this wine is bone dry, with gooseberry, lemon, lime, cats pee, and nice green notes. The mouth on this medium plus bodied wine is rich, with crazy acid, bracing tart fruit, that gives way to tart green apple, white cherry, and nice herb. The finish is long and tart with layers of fruit and mineral, slate, green grass, and rock. A great balanced wine with what I love, acid, mineral, and tart fruit. BRAVO! This is another lovely oaked Sauvignon Blanc that really works well. This was left in oak for three months. The nose on this lovely wine is perfumed with grapefruit, gooseberry, nice oak, and spice. The mouth on medium bodied wine shows lovely quince, great balance, guava, crazy pink grapefruit, citrus, rich tart apple, and lovely mineral. The finish is long and refreshing, with added complexity, rom intense citrus, mineral, saline, peach, and nice spice. NICE! This is one old school Sauvignon Blanc kind of wine, it has a bit of tropical fruit, but this is clean and dry and more straw and earth than fruit, just the way I crave my whites! BRAVO!Also, if you unwrap the bottle to not be shocked by the stopper – it is a glass stopper that can be reused many times on other bottles, so do not toss them!! !The nose on this wine is ripping with citrus and acid, straw, asparagus, gooseberry, straw, hay, ripe peach, kiwi, and nice spice. The mouth on this medium bodied wine is ripping with lovely acid, more lovely spices, an almost pily and lovely textured mouthfeel, nutmeg, followed by yellow grapefruit, green apple, with crazy lemon, lemon curd, and pith that goes forever. This is a wine that perplexes and delights, it tastes sweet from the ripe fruit, but bone dry from the earth, mineral, slate, and overall makeup. The finish is long and pithy with great nectarine, orange notes and more pith wrapped with mineral, slate, and earth. BRAVO!!! This is a new grape for the diamond series (what the series was called as the label showed Diamonds in the US but that is now dead with the new labels), now called Recanati series. The nose on this lovely wine shows classic SB notes, with cat piss, gooseberry, mad citrus, and apple. Wow, what a new world approach to this fruit, rich mouth of very good acid, with guava, sweet ripe notes, lovely pink grapefruit, melon, lovely mineral, and citrus pith that lingers long. The finish is super long and acidic with great slate, straw, wet green grass, ripe peach, and quince on the long rise of acid – BRAVO!!! This wine was the clear winner of the tasting, maybe one of the best whites to be released by an Israeli winery. When I last tasted this wine the oak did not dominate the aromas, now the fruit is slightly subsiding on the nose and exploding on the mouth. The nose starts with crazy oak, pink grapefruit, green apple, smoke, flint and vanilla. Wow wow wow what an acid bomb, ripping acid that blows my mind, some of the deepest acid I have ever tasted from an israeli wine, laced with rich quince, mad tart citrus, lovely apple cobbler, hints of brioche that are now showing very well and integrated, candied pineapple, melon, all wrapped in a crazy body balanced and complex and layered – WOW! The finish is long and acidic with rich toast and mad herb, cloves, slate, rock, hint of vanilla, and butter – INSANE! This wine is a blend of 90% Sauvignon Blanc and 10% Semillon. The nose on this lovely wine is classic with fresh cut grass, intense gooseberry, floral notes, with piss, rich lemon, and grapefruit. The mouth on this lovely wine is ripe and mouth filling, with great ripping acid, rich mineral, lovely and focused with crazy grapefruit, lemon, lime juice, wrapped in crazy saline and rock. Very few have shown this amount of mad acid. The finish is long with intense spice, straw, nectarine, along with lovely peach, lemon pith, and nutmeg that lingers long. BRAVO! This is a lovely wine that comes from the Weiss brothers, AKA Shirah Winery, and it is so not Cali it is wonderful!!!! This may become my goto white when I am in the mood for cold fruit and mineral.The nose on this wine starts with cold summer fruit, along with mounds of mineral and dirt. With time, the nose turns to vanilla, smoke, and flint along with floral notes of rose hip. The mouth on this medium bodied wine is rich with Alsace style approach, mineral, slate, rock, dirt, and some very cold fruit, mad quince bomb with some pepper/spice/smoke, along with green apple as well, herb and hints of nectarine. The finish is long and dirty with lovely dark fruit pith, more floral notes, straw/hay, and hints of sweet fig. Lovely and Bravo! What can I say – BRAVO! This wine remind me of a wine my friend Moises Cohen from Elvi Wines makes, called InVita. This wine is a blend of Trajadura, Loureiro, Arinto Azal, according to the importer.The nose on this wine is redolent with pineapple, ripping lemon curd, spiced lime, and lovely green apples, along with beautiful slate and mineral. The mouth on this medium bodied is almost oily and textured with sweet notes, followed by intense/insane ripping (truly ripping) acid, all wrapped in citrus bliss, nectarine, candied quince, and orange pith that lingers long. The wine is so spicy, acidic, and refreshing with sweet notes that linger long – LOVELY! To be honest there are few pure Semillon wines in Israel or elsewhere that are kosher. Midbar made some in the past, but not in 2014. Also, there was no Semillon made by Dalton in 2014 so get either NOW!!! A lovely nose of rich peach, apricot, intense floral notes, jasmine, and honeyed fruit. The mouth on this oily and viscous medium bodied wine, is perfectly balanced with wicked acid, mineral, and fruit, showing a lovely body, pear, rich honey, lemon curd, and summer fruit. The finish is long and bitter, with black tea, sweet herb, spice, hints of saline, mouth puckering acid, straw, and mineral. Lovely! The nose on this wine shows nice stewed fruit notes, peach with rich herb, but really the star is the honey and the melon and apricot, and lovely oaked summer fruit. The mouth is well balanced with good acidity that really lifts the wine, but the star is the viscosity that coats the mouth, with peach, apricot, pear, and dry herbs, that are wrapped in sweet fruit and sweet oak. The finish is a lovely floral madness, that is followed by mad pith and rich spices, nutmeg and cinnamon. Nice. Yatir has done it again, more old world, more dirty and dried fruit than sweet and ripe like the Yarden and Dalton 13. The nose on this light gold colored wine is rich with lovely peach, apricot, mad floral notes, along with yellow flower, and spice. The mouth on this medium plus bodied wine is viscous and oily with great texture, showing sweet pear, honey, and mineral. The finish is long and bitter, with great sweet tea, sweet herb, lemon pith, puckering acid bringing it all together, along with straw, and dried grass. Nice perfumed nose with peach and apricot and honeysuckle and honey with sweet quinine. Crazy acid with mineral and sweet herb and guava and bitter notes wrapping the sweet Apple and honeyed and candied yellow plum. Long and super spice with rich layered of oak and spice and bitter notes and saline. What a lovely wine for the price and the quality is impressive. The nose on this wine is rich and ripe with sweet notes, spicy and honeyed notes, with crazy sweet honeysuckle and herb. The mouth on this medium bodied wine is ripping with nice acid, showing a great structure, sweet notes and lovely quince, rich peach, apricot, with floral notes, straw and mineral. The finish is long and spicy, with lingering acidity and pith. The nose on this wine is lovely with tropical fruit, rich honeysuckle, sweet melon, nectarines, and crazy ripe and sweet notes. The mouth on this medium bodied wine is viscous and oily with crazy peach, quinine, litchi, and kiwi. The finish is long with good acid and structure that lingers long, nice pith, and apricot that is wrapped in herb and bitter notes. This wine continues to excel after its inaugural release in 2012. This vintage is more grassy and herbal and straw/mineral driven, with rich notes and crazy redolent nose.The nose on this straw colored wine is redolent with fresh cut grass, well dried straw, mineral, peach, and litichi. The mouth on this medium bodied wine is layered and rich with a complex blend of lemon pith, dried herb, tropical fruit, guava, melon, and more dried vegetation. The finish is long and herbal with lovely good acidity, bitter/salty/tart action all coming at you at once, with sweet fruit, mineral, and straw lingering long. Enjoy this with BBQ chicken, summer salads, and soft cheeses. BRAVO!! !The bottle has lost no step, it continues to impress and show rich acidity, spice, and mineral. I must say, this wine has never done it for me, any vintage, but it is here for completeness and because people really like it. To me, the quality to the price is underwhelming to say the least, and I have had older vintages of this with age and it still never showed really well to me. The price and the wine – are incongruent. The wine is a blend of 60% Roussanne and 40% Marsanne. It is under Roussanne because it is majority Roussanne. The nose on this wine is the freshest I have had to date, with fresh tart fruit, along with quince, lemon pith, and grapefruit. The mouth on this medium bodied wine is ripe and tart with gooseberry, sweet melon, apple pie, brioche, fig, and spice. The finish is long and tart and well balanced with peach, guava, ripe summer fruit, citrus, all coming to a pith/bitter finish. Nice! The nose on this wine shows lovely petrol, with bone dry tart fruit, straw, honeysuckle, grapefruit, and pineapple. The mouth on this medium bodied wine is rich and textured with great gooseberry, yellow grapefruit, intense citrus, lovely melon, honeydew, and nice warm spices. The finish is long with crazy acid, herb, bitter notes, intense tart fruit, floral notes, slate, and acid linger long. BRAVO! Depending on the year and release and the stock, there can be as many as 5 different rieslings sold by Ernie and Hagafen Wineries. There is the dry wine that started in 2012, and then there are varying degrees of residual sugar wines, including a couple of Prix wines and the three wines that come in the Hagafen label. This wine is a 2% residual sugar wine and it works great with sushi and asian dishes. The nose on this wine is rich, honeyed, and sweet, with citrus, grapefruit, kiwi, litchi, and sweet honey. The mouth is rich with spice and sweet honey, it is controlled, clearly sweet but the bracing acid really helps keep the wine in balance, with crazy peach, tropical fruit, light tannin, and lovely sweet spices. The finish is long and refreshing with ripping acid, guava fruit, and nice mineral. Bravo! This wine was one that I had never seen before, but tasted it at Sommelier and really liked it. The nose on this lovely wine starts off with petrol and soap, followed by peach, melon, and sweet tropical notes. The mouth on this medium bodied wine is viscous with great oily texture, showing sweet ripe and tart fruit, quite nice, with kiwi, green apple, honeysuckle, floral notes, and lovely balancing and ripping acid. The finish is long and and layered and sweet with great fruit structure, spice, and pear. Nice! This particular Gewurtz is really unique and is made by a small boutique winery from its intense mineral that is really nice. The nose on this lovely gold colored wine shows rich guava, lemon, melon, and soap. The mouth on this medium bodied wine is the real star, it is semi-dry, with crazy layers of floral notes, rope petals, massive spice, grapefruit, along with rich honeysuckle, that flows into honeyed fruit, honeydew melon, and nice spiced peach. The finish is long and and sweet with great balancing acid, graphite (yes graphite), mineral, saline, and slate, and rock. BRAVO! The nose is classic with rich honeyed notes, ripe and sweet with ripe melon, pineapple, and guava. The mouth on this medium plus bodied wine is textured and mouth coating with sweet notes, but well balanced with ripping acid, candied apple, banana, but controlled behind a wall of sweet fruit, honeysuckle, lovely rose water, and nice sweet spices. The finish brings it all together with more acid, lovely pith, and sweet controlled fruit. Very nice! Lovely chard nose with charred and sweet notes of Apple pie, honeysuckle, melon, honey, spice, and mineral. The mouth on this medium bodied wine is viscous with oak beefing up the wine, with quince, and butter notes, crazy nectarine, tart orange, and crazy spicy, rich oak and peach with mineral and nice acid that attacks with crazy fig and dried herb and pith. Long spice finish, with nutmeg, white pepper and nectarines pith and nice straw and slate. BRAVO! This is the second of the two single varietal whites that Midbar released in 2014 (the other being Viognier). This is an unoaked Chenin Blanc, with nice sweet fruit, but well balanced with lovely acid and mineral notes. The wine was just bottled and was in shock and clearly closed, but with time the nose opened to show nice dried apple and herb. The mouth on this lovely wine was wide open with lovely acid that is balanced with sweet quince, sweet apple, and apricot that give way again and again to spice and searing acid, with straw, garrigue, guava and pear coming together nicely. The finish is long and spicy, with mad acid, rich nectarines, orange peel and pith lingering long. Very Nice!!! Nice nose of kiwi, green apple, ripe melon, pear, not too tropical at all, and lovely flint, smoke, and rock. The mouth on the medium bodied wine is ripe and tart with lovely acid, ripping mineral, saline notes, mad grapefruit, lemon friache, rich peach and cold quince fruit. The finish is long and smokey with more lovely mad saline, crazy mineral, floral notes, and crushed herb. BRAVO! This is an ok Pinot Gris but lacks the crazy acid and is a bit too “sweet” for me, listed here for completeness. No there is no residual sugar, but the sweet fruit annoys me. The nose is ripe with honey. honeysuckle, almond, dirty earth, loam, and ripe white white fruit. Too sweet for me, with ripe summer fruit, and rich fig. Nice enough, but stick with the 14 or 13 Dalton PG. The mineral is its saving grace. I will admit that over time, the wine’s sweetness calms down, but when it does it tastes like a complex version of the blue bottle – which is not saying much. This is the first vintage of this wine from Lueria and it is lovely. The only real con is the mad bottle variation this wine has. I tasted it three times, and others had it it many times and it is kind of hit and miss. Still, if it is a hit, it is crazy, unique, and very good! What a lovely wine made from “iced” Gewurtztraminer grapes that were picked late. The nose on this golden elixir is ripe with juicy pineapple, crazy sweet guava, melon, jasmine, floral notes, and an intoxicating perfume of tropical sweet fruits. The mouth on this full bodied assault vehicle is viscous, rich, mouth coating and crazy with an oily texture that coats along with honeyed fruit, honeysuckle, sweet white chocolate, white peach, and candied kiwi. The finish is long and well balanced and all together fantastic, with bracing acid, candied fig, and mineral, stone, and lovely pith – BRAVO!!! This wine may not be as good as the world famous kosher 1999 vintage, which may well be one of the best kosher wines I ever tasted, but this is no slouch in any way! This was enjoyed side by side with the 2001 Piada and though the Piada is lovely, this crushed it.The nose on this golden and honeyed colored wine is ripe and sweet with quince, date, along with a round nose of perfumed funk inside a mushroom patch, along with honeydew melon, tangerino drink, and mad mango! The mouth on this insanely full bodied wine is filled with rich dried ripe apricot, peach, along with layers of concentrated, ripe, and dried fruit that hits you like waves of fruit, including candied pineapple, candied orange, lovely orange blossom, and vanilla! Mega Bravo!!! Posted on June 3, 2015, in Israel, Israeli Wine, Kosher Dessert Wine, Kosher French Wine, Kosher Rose Wine, Kosher Semi Sweet Wine, Kosher Sparkling Wine, Kosher White Wine, Kosher Wine, Wine Tasting. Bookmark the permalink. 18 Comments. I would love to know the RRP of the wines though, and if they are good excellent or poor value for money in the place you tried them? Hello Mark, are you asking to know the RRP (Rough Retail Price)? Not sure what RRP is. For the “best deals” I use the QRP moniker. Finally, many of the wines are Israel only wines with many also making it to the states.